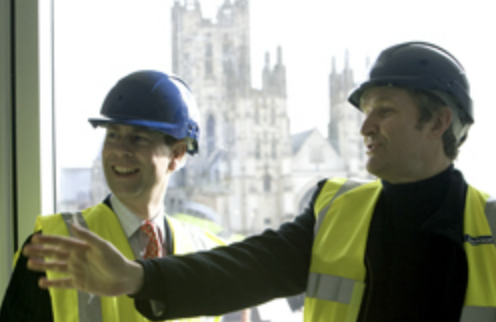 His Royal Highness Prince Edward The Earl of Wessex, visited the Marlowe Theatre construction site to see for himself progress on the delivery of this remarkable cultural building. The Earl of Wessex who is Patron of the Marlowe Theatre was escorted by Keith Williams along with Peter Williams, Chairman of the Marlowe’s fundraising campaign, Janice McGuinness Head of Culture & Enterprise at Canterbury City Council, and Colin Farmiloe of contractors ISG Jackson. Prince Edward praised the efforts and enthusiasm of the project team for the work that they are doing to ensure the building programme is on schedule to open in the autumn of this year, and made a particular point of speaking to as many members of the actual construction workforce on the site as possible, whose job in the end it is the actually build the project. Each stone column weighs more than 4 tonnes. The Studio has fully retractable seating and accommodate up to 150 seated, or 300 in standing room format.